The Mani mantra of Avalokiteśvara arranged on a lotus Mandala. 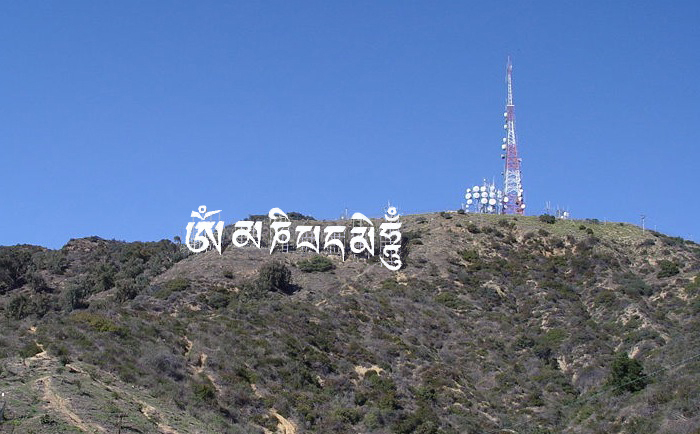 "Mani-wood" The famous Hollywood sign adapted by Tashi July 2009. It is said that on seeing the form of the Mani mantra, to hear the sound of the Mani mantra: oṃ maṇipadme hūṃ is to purify and liberate from the un-enlightened state of ignorance. "It is very good to recite the mantra oṃ ma ṇi pad me hūṃ but while you are doing it, you should be thinking of it's meaning, for the meaning of the six syllables is great and vast. Thus together these syllables mean that in dependence on the practice of a path which is an indivisible union of method and wisdom, you can transform your impure body, speech, mind into the pure exalted body, speech, mind of a Buddha." The practice of the Mani mantra and how to integrate pure perception on a spiritual path is explained further here. 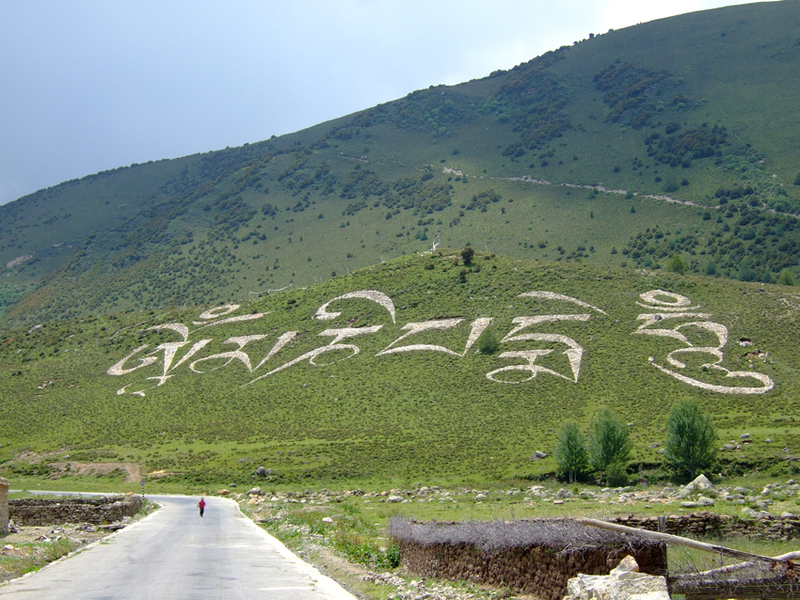 In Tibet, whole hillsides are seen as a great opportunity to plot out huge images of the sacred mantra, often with white stones. Such constructions are believed to emanate blessing across the land, if not as a constant reminder of the mantras sacred and positive meaning. A enormous Mani mantra in East Tibet. The mantra was also commonly carved on flat stones and piled up in great heaps that sometimes stretch for a mile or more. As an act of respect, a person would always pass with the mantras on their right, circling clock-wise. 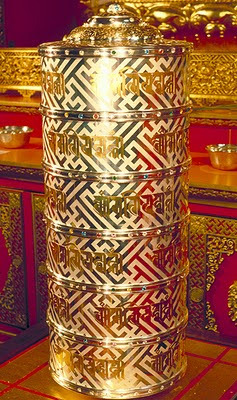 Other such devotional activities, such as hand spinning prayer wheels filled with mantras minutely printed on tight coils of paper, is considered that with a good intention and the act of turning the wheel, the power of the mantra is activated, similarly mantra printed prayer flags utter their prays caught on the wind. In our modern times the sacred Mani mantra could not be more applicable in meaning and benefit. For the meaning of the Mani mantra is steeped in Loving-kindness and understanding, each of the six syllables purifying and converting negative emotions into wisdom, which is a fundamental basis to our confused state of being, that transformed; can only lead to a happy state of mind. in gold Lantsa Sanskrit lettering. Our modern world also allows prayer wheels to be driven by electricity. 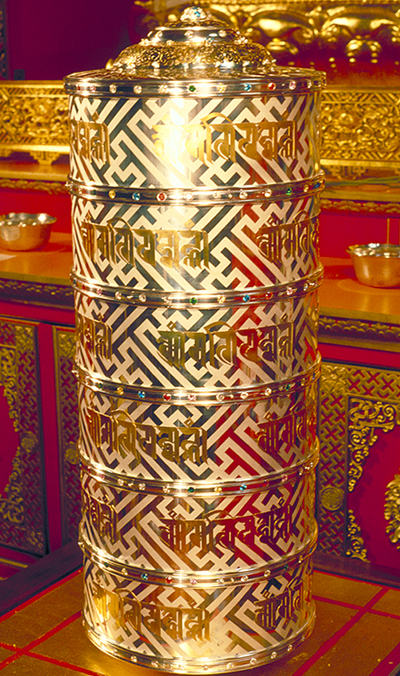 The prayer wheel pictured above, housed at the Samye Ling Temple in Scotland, contains billions of Mantras on micro film. For every one rotation of the wheel; there are seven Mani mantras dedicated to each Human being on the planet, the praying wheel turns continually day and night. The earliest written version of the Mani mantra is know in the Lantsha and Wartu Sanskrit forms, used by Buddhist monks in India and Tibet in the 11th century. The mani mantra in the ancient Wartu or Vartu Sanskrit. The beginning of the Tibetan written language was developed to accommodate the migration of the Buddhist teachings from India to Tibet. The original Indian manuscripts were scribed in both Lantsha and Wartu, these were fundamental to the Buddhist textual tradition and very much their visual identity. 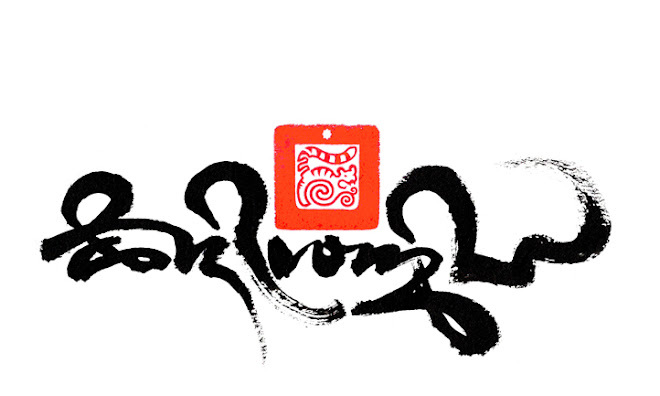 Indeed Lantsha and Wartu is still today considered a sacred and classical written language, which is often upheld; painted and gilded high up on Tibetan temple walls, beams and pillars. As the written form of a mantra is considered divine, there was much care and respect when translating Sanskrit to Tibetan. Moreover, most mantras where translated phonetically into Tibetan, maintaing as near correct as possible to the original quality of sound, which is considered integral to the meditation practice they belong to. 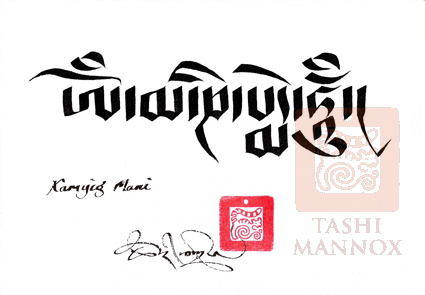 The classical Uchen script style is perhaps the most common and recognizable of the Mani mantra in Tibetan, a script style very similar in appearance to Sanskrit to an untrained eye, so it is somewhat understandable that the Uchen style is often miscalled 'Tibetan Sanskrit'. 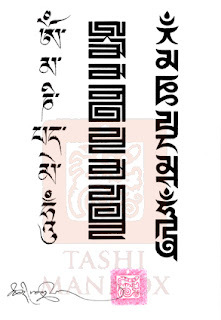 Below follows a list of the Mani mantra in the main Tibetan script styles, these are shown without the traditional 'heading character' the addition of a heading character dose not change the meaning of the mantra, for more explanation on the heading character please visit here. A more standard version of the Mani mantra in the Uchen script. The Horyig and Phags-pa scripts are related to Mongolian and where developed for the use of seals across Mongolia Tibet and China. A more in-depth explanation on the Phags-pa script is shown here, and for the Horyig script please click here. The Mani mantra has in recent times become popular as a tattoo design. Because the mantra is a sacred word, there are advised guidelines as where and where not to place the mantra, this is not only to safe-guard the mantras integrity but also to curb any negative karma to others and ones self in miss-placing the mantra, such as up-side-down or back-to-front. 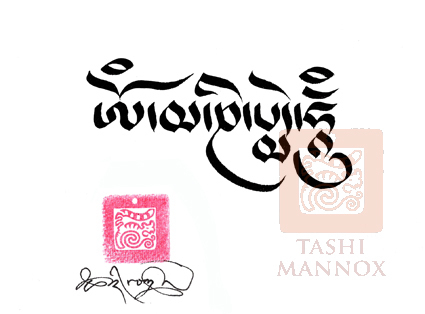 Many of the above mantras and more are available as easy downloadable images from the Tashi Mannox on-line store. The mantras are sent as high resolution digital images, as it is important that for a clear precise tattoo, a clear sharp template is needed for the tattooist to work from. 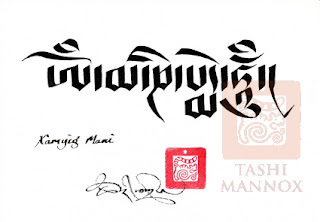 The Mani mantra can also be arranged vertically by stacking each syllable one below each other, however there needs to be some understanding of the construction of the Tibetan written language to know where to divide the mantra; in order to stack vertically yet still read to make sense. Can the Mani Mantra be written at the vertical? Though it is not so traditional, the Mani mantra can be written vertically, but one needs to be carful in understanding how to divide the characters correctly to stack them one below each other vertically. Otherwise the mantra will not read properly. is it bad luck if you tattoo the mani mantra when your not buddhist? Can anyone tattoo this on their body as long as they believe in it? it is in the Buddhist philosophy that every living being is accepted with compassion and that all living sentient beings be freed from suffering. And it's the mantra from Buddha Avalokiteshvara.. and his is the Buddha of Infinite Compassion. So yeah i think it's ok! Anybody can benefit from having the Mani mantra on their body if the right intention and believe is there. I want to have a tattoo of the seed syllable Hri which is in the centre of the "Om Ma Ni PehMe Hum"...Will it have a meaning...?Or is it a must to have the full mantra?.. The Hri syllable can be depicted alone without the mani mantra, it still holds integrity of its own meaning. I was wondering what the Mani Mantra means? There is an explanation and meaning of the Mani mantra at the start of this post, by H H Dalai Lama. 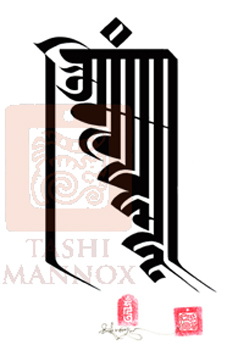 yes, i run a service translating English to Tibetan for tattoo designs in the various forms of Tibetan writing. Perhaps the inside of your upper arm in not the best place for this sacred mantra, as encroaching the armpit area is not so dignified. 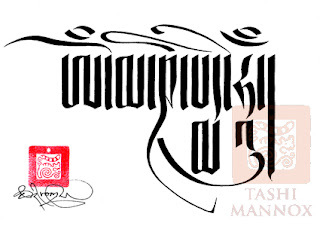 Each letter can be connected to the last in the characteristic vertical Horyig script, though this needs to be carefully organized and a high resolution image required from which a template is made for a clear sharp tattoo design. You may like to contact me on info@inkessential.com to acquire a clear digital image for your tattoo. I'm currently starting my studies in Buddhism by myself, and I'm a little lost and confused with the lots of information I've found. One of my main concerns is that I would like to practice both Zen and Vajrayanna, is that counterproductive? Could you point me some good books or give some pointers to a beginner? 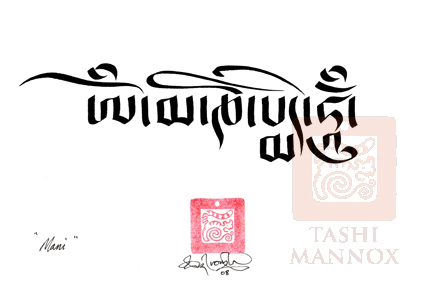 Now about the drawing: I'm considering getting a tattoo of the Vajrasattva mantra in Vartu script, do you think that it's appropriate? Where should be a good place for it? There are many different traditions of the Buddhas teaching and practice that has developed differently in different locations. The origins Zen Buddhism started in China, though the characteristics that makes Zen Zen as we know it today, is influenced by the Japanese culture and the way that the Japanese people are. Whereas Vajrayana is one of the three main vehicles that the Buddha taught that may encompass Zen as well as other traditions, but i would not say that Zen is especially Tantric. Actually, of all the Tantras that make up Vajrayana, only a few of these Tantras historically migrated as far as Japan, so the complete teachings and practice of Vajrayana did not fully establish in Japan. What did establish is called Shingon. If you mix teachings from different traditions you will find differences and contradictions, it is not like one is right and the other is wrong, it is just that they are different to suit the culture they have established with and different in their origin, be it from Hinayana, Mahayana or Vajrayana. On the other subject of Vajrasattva... The mantra associated with this deity can be depicted in a number of languages, in someways a reflection of what i have been explaining above. 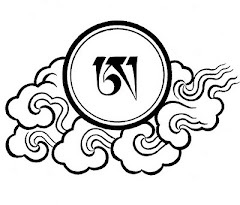 The origin of the Mantra is Sanskrit, as Vartu or Wartu is an ancient Sanskrit script style, that just so happened to be persevered by the Tibetan Buddhist traditions, because of this it is perhaps more appropriate depicted in the Wartu script style, though the mantras can be more commonly found scripted in the Tibetan language. The information i have written here is perhaps on the basic side, of course there is a lot more to it than i can write in this small area, but the questions you ask are quite big, so i have tried my best to be more simple and concise. Your answers have clarified my doubts. I intend to make the one hundred syllabe mantra tattoo on my chest. When I feel confident enough about that I surely will contact you! I found all this information very enlightening, i want to get the mani mantra tattoed on my spine vertically and i have a question for you. Can the 4th and 5th syllables be stacked? (having the 5th syllable under the 4th) or do they have to be only the way itis on your drawing were two parts of the syllable are next to each other horizontally and part of the 5th syllable is under? Ive seen it tattooed both ways but not sure if both ways are correct, thank you so much. If you contact me by email, i can send you examples and explain the difference and correct ways the Mani mantra can be stacked vertically. please get in touch and remind me of your questions. can it b tattooed on foot? I presume you are referring to the Mani mantra mandala? which is found at the top of this post. Being a mandala the cardinal direction that always faces us is East. The eastern direction is always where the start of a mantra or seed syllables of buddhas or deities is placed. 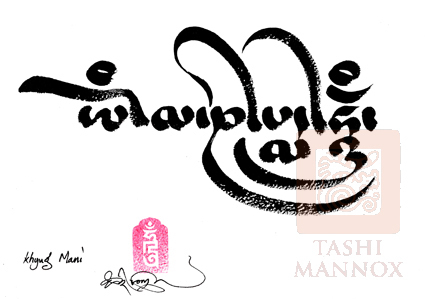 So the first letter of the Mani mantra is placed in the East direction at the bottom. This very much relates to the traditional practice of visualization in meditation, in this case the mind aspect of Chenrezig. If the first letter of the Mani mantra is placed at the top, this means it is in the Westerly direction and the furthest away from us. 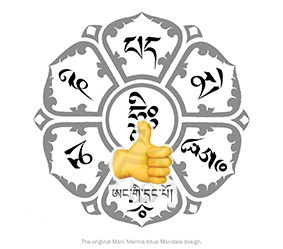 I hope this makes sense, but in short, there is a good reason and correct way to place the Mani mantra on the lotus mandala reading from the bottom first. Your post is so informative! Anyway, I would like to ask whether the Lantsha script can be connected as one bar; similar to how you connected it in the monogram format, but as a straight horizontal text? I also read that you don't recommend the mantra on the inside of the upper arm. I originally thought of putting it there so that I could most readily read it and have it close to my heart. Do you think that there is a way that I can put it there while still showing it proper respect and dignity? 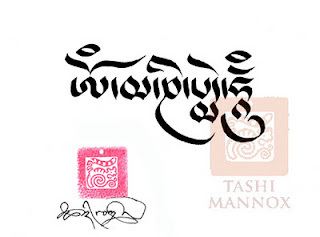 The lantsha Sanskrit script does not traditionally connect at the top as one horizontal bar unless it is written as a combined monogram. 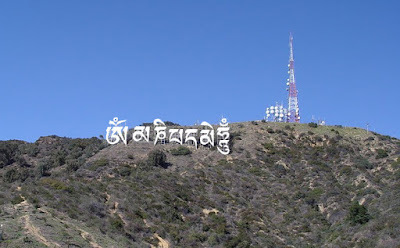 However there are some very similar script styles that are often mistaken for Lantsha that do link up as one horizontal bar, such as some of the Himalayan Newari scripts and the more contemporary Devanagari script. Personally i would not recommend a sacred mantra to be placed too near a sweaty armpit, but it all boils down to your motivation and if you consider it nearer your heart, then so be it. Ultimately it is best to meditate on a sacred mantra as a visualization practice in ones heart, there are very specific visualizations traditionally practiced which with devotion can be far more effective than a tattoo on the skin. may I ask if there are specific colors of green, yellow, blue, red when it comes to the Mani mantra and wearing it as a tattoo? ie. dark green, sky blue etc. There is a specific order of colours for the Mani mantra, however not all of these colours are so practical and effective as a tattoo, but if your tattooist can ink similar that would be very good. oṃ = white. ma = green. ṇi = yellow. pad = light blue. me = red. hūṃ = dark blue/black. Hi Hope you are well! I would like to know if I can use the Mani Mantra in Uchen Script (found in your website) for my tattoo. Can i also add the Hri at the end? I am planning to get it done on the outer portion of the palm in my left hand. Kindly let me know if the place is appropriate. I would not say the palm of the hand is the best place for a sacred mantra, but if any hand it will be the right hand of course. Once purchased you can down-load the design and print out as a clear sharp tattoo template to take to your tattooist. Now I've seen it a few times, always described or captioned as "Om Mani Padme Hum" but I've never been able to find any authenticity. Could you help? The image you found on Flicker is not the Mani mantra "Om Mani Padme Hum", this is an abstract artwork by another artist, it is not authentic Tibetan, it is not the Mani mantra, in fact it does not read as anything, it is like a made-to-look-like Tibetan or Sanskrit script. Perhaps the artist was inspired by the Mani mantra to paint this piece, but it is not the actual mantra. The red seal in the artwork may give the impression of authenticity, but it is not, though agreed, a beautiful artwork. thank you so much for your clarification! What a remarkably informative thread you have here. So this is purely a tattoo question, since being young i had a tattoo on my forearm of a skull, I am looking to incorporate it into a Buddhist design, perhaps representing death and impermanence. Would it be appropriate to have the skull sitting in a lotus flower on water which would in turn wash footprints off a beach?. I understand the difficulty in achieving those effects with the water and beach but putting that aside would such an idea be appropriate. Would you like a commission to design a decent cover up? For pictorial tattoo designs and especially for a cover-up, it would be far better to ask the opinion of a tattooist rather than myself who specialises in Calligraphy designs. I am looking to get the Om Mani Padme Hum tattoo symbols in a lotus mandala. My question is, instead of having the HRI in the center, would it be appropriate to have the OM universally written ॐ instead? I would not consider this a good Idea, it is mixing up different traditions and languages, the Hindi om is not the seed syllable of the Mani mantra. the ॐ character has its own integrity. What exactly is the seed syllable HRI? The Hri syllable is the essence character of Avalokiteśvara, who is the Bodhisattva of Infinite Compassion. During the practice and recitation of the Mani mantra, it is visualised that the mantra turns clockwise around the hri syllable at the heart centre of Avalokiteśvara that emanates light rays to bless and benefit all beings. The quality of Avalokiteśvara and light rays should be seen as rainbow light. So as I have explained, the hri syllable is an essential part of the Mani mantra. I am seeking help regarding the proper colour of the HRIH syllable. Associated with Chenreizig I have always known it to be white. I've seen it depicted in other colours and wonder if this is appropriate. Will you please help me with understanding these details. Indeed the traditional colour of the Hrih character is white, however it would depicted in black if all the other syllables of the mantra are also in black. Sometimes you may see the hrih syllable in red, however this belongs to another deity called Dorje Palmo or Gyalwa Gyamsto. It would not be appropriate the depict the hrih character in red when associated with the Mani mantra of Chenrezig. First of all I'd like to thank you for all this information you are giving us. I jsut got a question for you, as another person here I'm looking to get a big Om Mani Padme Hum symbols tattoo in a Lotus Mandala. I'd like to have it in my triceps zone and I think the petals will comme a little to the front of my arms like "embracing it".. ( I'm sorry, my english is not perfect) Could you please tell me if the place is appropiated? because I've been reading your link abour sacred integrity but there's something that I don't get... when you say "not to place (it) back-to-front"... and I'm afraid tha'ts what I'm planning to do! Back-to-front means to reverse the image, so that everything is backwards, it seems you are not doing this, so the way and placement you intend is respectful enough. Thank you so much for your answer, Tashi! I hope that this thread is still active because I have learned so much. Thank you!! I plan on getting the hri symbol tattooed on my inner wrist facing me so that I can see it read it correctly, however, when my arm lays in a neutral position (down) or when others are looking at it, it will appear "upside down". I'm confused which is appropriate. The symbol and the meaning is so beautiful, I'm hoping to have it placed there as a constant reminder. Also, is the correct pronunciation hri, as in hurry without the u? Yes this feed is still live, though less attended because I am super busy with other projects. Any syllables on the wrist should read the right-way-up to your self when looking down at your wrist. I just found a necklace that I am very interested in. The necklace interpretation of Om Mani Padme Hum is written in phags-pa script. I have looked and looked but I'm having trouble finding matching symbols. 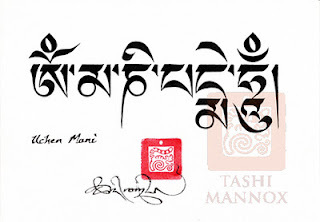 I am used to reading Om Mani Padme Hum in Tibetan and reading left to right. Could someone please help me identify if this is the correct inscription on the pendant. Any and all help would be greatly appreciated. Here is a link to the necklace. Where is the link to your necklace ?